The first time I hear The Point I'm fourteen, sitting with my boyfriend at the back of the bus, talking about the Himalayas. A million girls would kill for the chance to meet The Point, but Nina’s not one of them. IT'S OFFICIAL! I LOVE THIS BOOK MORE THAN ANY OTHER BOOK RIGHT NOW! I'm actually struggling to move onto any other book, because it was so good. I'm suffering with a severe book hangover. Nothing compares to the love story I've read in this book. It takes me back to Bella and Edward in Twilight and yes, I'm publicly admitting my love for Twilight. The main character, Nina, gets to go on tour with one of the hottest boy bands around, but she is so disinterested in them. She can't see why her sister is so mad about them. But it doesn't take long, before Nina sees the boys for what they really are, four young lads who really love to make music. And the band really see Nina for what she is. There is a beautiful love story in this book. Nina falls heads over in love and it melts your heart. It made me actually want to be in the story. I have had a dream that I was Nina! Now that is a sign of an excellent book. This book took me back to my teenage years when I was convinced that George Michael would eventually be my husband. You don't even want to imagine the tears when I found out he was gay. 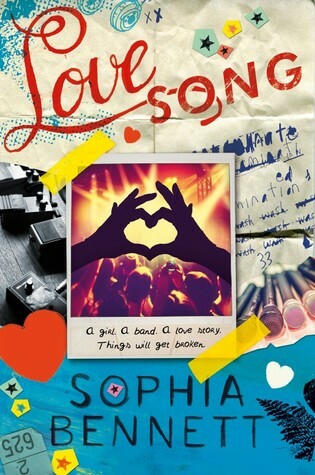 But boy bands have always held a special place in my heart, from Boyzone to Take That, from Westlife to McBusted, and this book made me love them all over again. Every girl dreams of having a chance like this. The opportunity to spend time with the bands they drool over. Sophia Bennett really brought that dream alive. I struggled to put the book down. All I wanted to do was lose myself in Nina's world. I couldn't even tell you what the plot, the writing or the characters were like, because I was too engrossed in the story to notice. I loved it so much, I've made it my Book of the Month for March. It will definitely be one I will be insisting everyone reads. I would really love to see this book being made into a longer series. I think the rest of the band seriously need their own books too. This book will be loved by One Directioners as well as Youtuber fans. It is just what the YA market needs.